This was a normal family breakfast, the morning after Ameir and I got married. Look at all the plates, and how everything is arranged so that everyone can reach everything. Note that instead of a plate, everyone has a piece of bread. 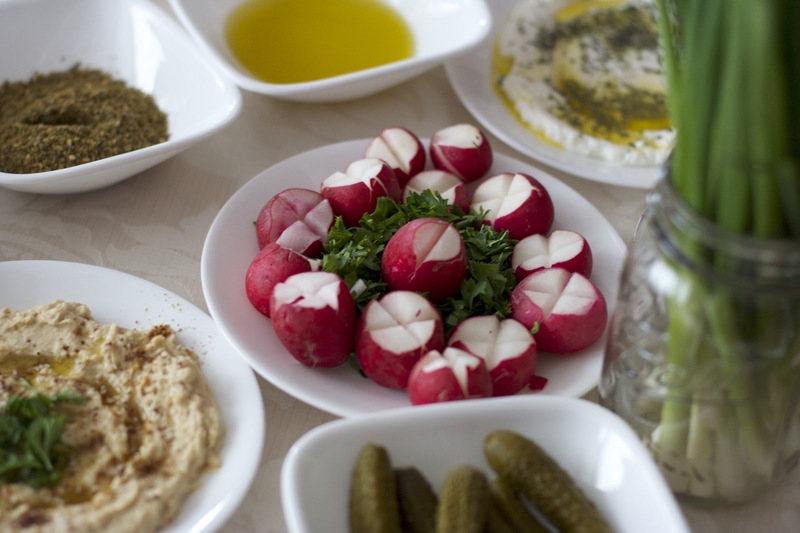 They tear off pieces and dip them into the plates in front of themBreakfast in Syria is an event in itself. There’s no concept of a “quick bite” – that is a horrid Western innovation. Blasphemy, really. Breakfast is meant to be enjoyed, eaten slowly, in the company of family and friends, and then extended for at least two hours with cup after cup of hot, sweet tea. I had my first experience with a full Syrian breakfast when my family and I went to Syria in May 2006, when Ameir and I had our Nikah. There’s an art to it. The whole family sits together, most often on the floor with a medda (spread) laid out before them. There are no plates. 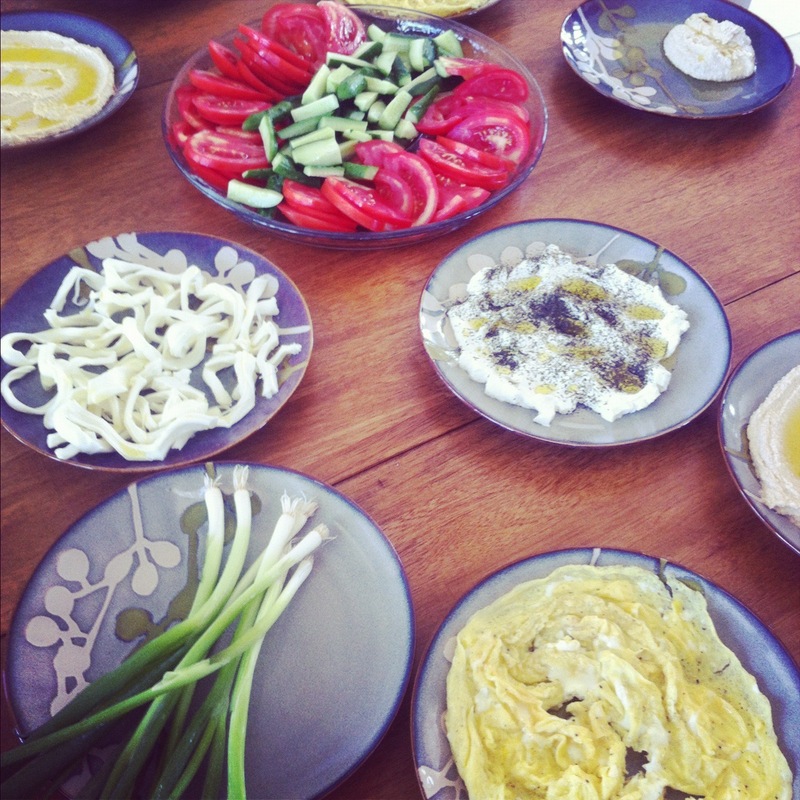 Breakfast is eaten communally – everyone has a piece of bread and dips it into the various items. Thus, each dish must be laid out in a pattern, such that each person can reach each plate with their little chunks of bread. If there are a lot of people, there are two or three or four iterations of each dish, and the pattern is spread symmetrically all the way down the medda. The symmetry is not to be taken lightly, as I learned. As a new bride at my in-laws for the first time, I naturally tried to make myself useful around the house. So, as Fatimah plated all the dishes, I helped Ameir and Maryam’s cousins carry them to the medda. Once I got there, I just set them down sporadically. They’d smile and say “Shukran.” I’d say “Afwan” and walk away for another plate, happy that I helped. When I came back with another, I noticed that the plate I had put down earlier had been moved. I thought nothing of it, and put down the new plates. “Shukran!” “Afwan!” Third sets of plates in hand, I noticed that the second set had been rearranged. Finally, I got it. I just laughed, and then just started handing the plates to the cousins to let them arrange them symmetrically. They laughed too – because of the language barrier, they couldn’t really explain what I was doing wrong, but they politely let me keep doing it without making me feel bad. Every morning, Fatimah would lead the production of a kingly spread of cooked and fresh plates. Served hot or warm were baid – scrambled eggs; fool – warm, cumin-spiced fava beans topped with fresh tomato, onions, and parsley; tis’iyyah – yesterday’s hummus and bread cooked together with a tangy tahini sauce; mana’eesh, flatbreads topped with zaatar, ground beef, or feta and cheese; and falafel, fresh from the shop on the street corner. 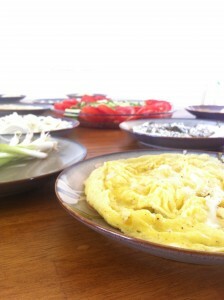 Everything got a healthy drizzle of fruity extra virgin olive oil, maybe even from Jiddo’s (Ameir’s grandfather) farm. The morning after Ameir and I got married, Ammo (my father in law) made fried liver as a special hot plate. I am not a big red meat eater, and I especially have trouble with organs. My father in law is extremely hospitable and generous, and he naturally offered me the plate. I declined, and he thought I was just being shy. “Ameir!” he said, “Give her a bite!” Ameir knew I didn’t like liver, but out of respect for his father, he couldn’t say no. I gave Ameir the “please, no” look, but he had to do it – he tore a piece of bread, picked up a piece of liver, and put it in my mouth. “How is it?” asked Ammo eagerly. Without chewing, I smiled and nodded. “Wonderful!” he said, and turned back to talk to my father. Meanwhile, I jabbed Ameir in the leg, motioning him to give me a napkin. I carefully released the liver into said receptacle. A few minutes later, Ammo turned back to me and Ameir. “Ameir, give her another bite!” But instead of watching this time, he turned back to laugh with my dad. Spared! It really was a hilarious scene, even at that time. Now, don’t get me wrong – he’s an expert at fried liver. But I just couldn’t do it. Thanks anyway, Ammo! Cold plates include all kinds of fresh vegetables, sliced and served separately – radishes, cucumbers, tomatoes, bell peppers, whole green and black oil-cured olives, scallions, flai-flai (a peppery green similar to alfalfa), and an interesting little thing called ajoor. Ajoor are kind of dwarf watermelons; they’re light green with ridges. Inside, they’re about the color and taste of a cucumber, but are crispier than cucumbers. 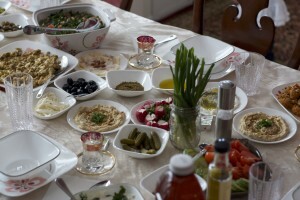 Alongside all the vegetables are laban – thick yogurt sprinkled with dried mint and drizzled with olive oil; hummus drizzled with olive oil and topped with olives and chickpeas; slices of a mild-flavored Syrian cheese similar to mozzarella, and a creamier cheese topped with tangy apricot or peach jam or sweet honey. Next to each person sits a small, never-empty glass of shai, hot sweet tea. It’s a lighter brew, a golden amber color, so that the flavor of any fresh herbs – usually miramiyya (sage), na’na (mint) – comes through (and so you can drink as many cups as desired). The host will keep fill your cup the second it’s empty, needlessly asking “Soobik shai kaman?” – Should I pour you more tea? – as the cup is automatically refilled. Also ever-flowing are the praises to the cook. Yaslamo eidaiki! May your hands be blessed! call out the breakfasters. Sahtain! Allah yasalmik! replies the chef – May you have two healths, and may God bless you. An hour later, the plates are mostly empty. Leaning back against the sofa, you spend another hour nipping at the edges of the laban to pair with the four more cups of hot tea, reminiscing with your family about happy memories. Every once in a while, a family should have a good Syrian breakfast. Leave the bowls of cereal or the pop tart. Forget the plates, spoons and forks. Spread a medda, sit on the floor and enjoy the food and family. 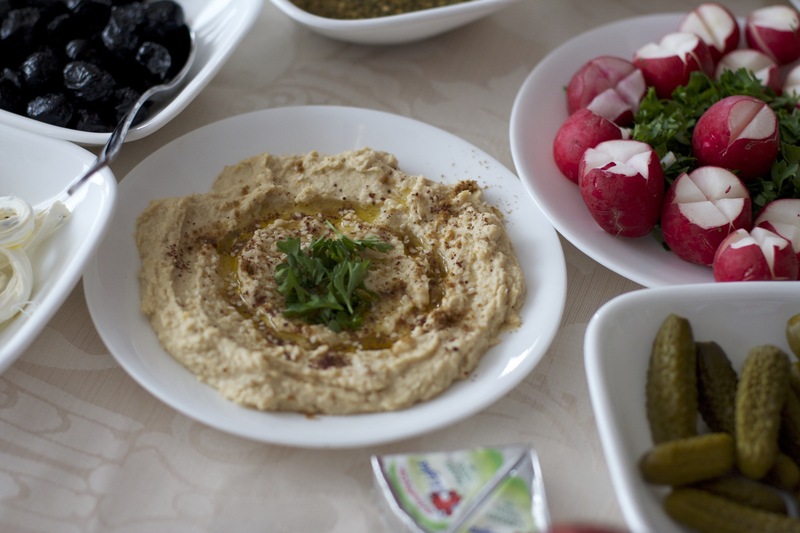 I once had a Syrian suhoor after a night of qiyaam at my friend’s house–i had no idea the treat i was in for–dishes and dishes of zaatar, hummus, aieeesh, olive oil, chai, foul, mmmm . . .
then a blissfully full, fast-ready tummy as we prayed fajr. Hahaha I got TEARY eyed–I love those gatherings…nothing like them. Man.. that looks awesome. I’ll bet everything tasted great. Hopefully I can visit Syria one day. Syrians are cool, especially this one named Ameir. PS. I LOL’ed at the liver story. Taiyyaba – thanks for taking me back to Darra’. I remember every moment of it. 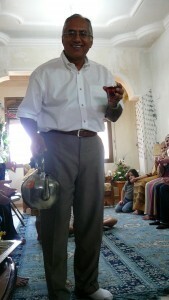 The Al-Zoubi’s were simply fantastic hosts. There was nothing but family love all around! I never wanted to come back. From young to old – they treated us like family and more. AND the food was simply out of this world! I was physically there (as you can see in some pictures) and you made me feel as if I am eating all that right now – yum yum yum. And the sips of Shai (tea) capped every thing. When are we going back?????? Not to have another Nikah but simply to visit and sit around the medda and EAT EAT EAT EAT! Love you and Ameir and the Zoubi’s. You are the best. Hi! I saw the comment you left on my post about Mezes on the Kitchn food blog. I really like your blog – so interesting! ohhhhhhhhhhhhh Taiyyaba the comments you made about Syria and the lovely moments we spent together there, it is so sweet of you. We love you! I just discoverd you and enjoying your writing ,i’ll come back enshallah ,you are a goos story teller Taiyyba.